The term started for mothers and miracles today, and I drove Vivi and I there myself, which is a big deal. Michael took my mom’s colt, which is currently living in our garage, to work so that Viv and I could use our car, which has the baby seat it. So I got up at eight, pulled the car out of the carport, got myself and Vivi’s stuff ready and then woke her at about twenty to nine. Quick nappy change and bottle, and we were ready to roll. We danced and made music and everyone sang to her for her birthday, while she wore her birthday crown. And then she got a finger biscuit at the end, as always. The difference is, now that she has top teeth, she was able to take nice bites out of it. Was fun to watch. I was able to cope alright with the outing, although I am feeling tired now (physically). The driving was fine though, which was what I was a bit stressed about. All is all, very successful. Oh and Vivi interacted very nicely with a little boy, who is two months younger than she is. She’s much more gentle now and I don’t have to worry about her scratching his face, or pulling his hair. And she crawled onto this little boy’s mommy’s lap, too. You could say she is right at home at this little group. Oh, and she does love the dogs. Among her first five words have been “Teddy” and “Bear” 🙂 She is so delighted if they come into our bedroom. It’s like, “Yay, partytime!” and if they leave the room again, she waves and says, “Bye”. Then it was almost time for daddy to come home, so we went to the sitting room to play. She had a session on her Ybike, which she riding quite well already. I was hovering over, lest she fall, and I got to thinking maybe I should give her a little more freedom considering that she is keeping her balance so well. The thought had barely crossed my mind, when she slid off her bike, right onto the tiled floor. She fell over and bumped her head, fortunately not hard. The bum took most of the brunt. She had a little cry, but not too bad. Didn’t stop me from feeling like a total sh$t, though. Did answer my question. No ybiking without mommy helicoptering over her! I’d like to type more, but my right hand is now kaput. I’m having to backspace half of what I’m typing 😦 My poor hand. It’s considerably recovered, but far from right. Plus, only an hour of naptime left. I’d like to read a bit. I felt so emotional on her birthday! No longer my tiny baby. Very quickly approaching toddlerhood. I am so, so thankful that she is doing so well. And that I’m doing all right. We celebrated her birthday the whole of Friday and Saturday! On Friday morning, her and I went off to our mothers/ babies group. She got really nice presents, including a dolly pram from Aunty Candy and Luke, a pop-up Little Red Riding hood book and pooh bear plate/bowl/ cup set from Aunty Mené and Mehan and a Barney activity pack from aunty Charlyn and Hannah. We took a cake and everyone sang to her and I helped her blow out her candle. After nap time, we went to the Archer family, where she had another fab party. She played with all her presents on the sitting room carpet. Her cousins played with her. She was spoiled with a lovely big hound dog (plush)from Aunty Melany, a duck on wheels that plays music, a soft duckie (she loves ducks) and the sweetest baby doll from her grandparents. She kept on planting kisses on that little doll and saying “baba” over and over again. Then, our next door neighbour, who calls herself Vivi’s “Amper Ouma” had a beautiful cake made for her, with a photo of the birthday girl printed on the front. She also knitted the most beautiful blanket for Vivi. Took her six weeks, and it’s amazing. On Saturday, my sister Sonja kindly hosted a party for Viv for the out-of-towners, my younger sister and her family,from Joburg and Vivienne’s godparents from Pretoria, Jessica and Ettienne. Also my parents and a local friend of mine, Angie were there. Cue more spoiling of the birthday girl: A musical toy with loads of buttons from aunty Annie, which also included a stacking ring ♥! From Angie, a ride-on lobster inflatable water toy for summer and the sweetest rag-doll from Angie’s mom. From Sonja and Jannie another baby doll (so she has twins!) a sweet dress and Hello Kitty cupcakes. And from Jess and Ett, a pink Y-bike!!! (I am very pleased with that especially) and a lovely hooded gown. Also a ducky toothbrush (more duck stuff 🙂 ) And Jessica’s 20 year old Telly Quack!!! All washed and looking brand new. I haven’t been able to find a soft, plush duck anywhere. I mentioned it to Jessica and she surprised us with the duck! I am so grateful to everyone who spoiled our little girl and celebrated with us. It took baby girl and I about two days to recover from the partying. We were knackered! The reason I can type this at leisure, is that it is naptime. Vivienne has recently instated a strict nap-time, from two pm till five pm. I am not complaining! She wakes up around 9am and then she has bottle, we listen to music and she plays with her toys in her cot. Then she eats some maltabella pap with me.Then she comes out of cot and we read a bit of book. This is all very typical. But then she wants to be active and we go to the tv room where she plays with the more interactive toys and crawls, crawls, crawls. then we go onto our front stoepie and sit there for a while (sometimes Tannie Rina comes out to say hi to us). Then it’s crawl some more and whizz around in the walking ring. By this stage, daddy is on lunch, so we eat something, sometimes we go to town with daddy, if we need something. Then I wash and sterilise her bottles, have some tea, chillax and put some supper on. Unless we had a big lunch, then I don’t. She naps until five and then it’s all systems go again until 9 or 10 pm. Which I don’t mind, because she sleeps an uninterrupted 11 or 12 hours at night We go to bed late anyway, Michael and I. And even though she goes to bed late, she is utterly pleasant. She will sit in her cot and chat to her dolls, no problem, while we bath and get ready for bed. And yes, I do know how insanely lucky I am. I can hardly believe it, but my baby girl is almost one. We’ve spent a whole year with this sweet, wonderful little person. Tonight she was standing against the couch, flinging her dad’s pj’s onto the carpet, the litte minx. She’s had a couple of nights of not being herself. Everyone still had pretty much their full quota of sleep, but she’s been going to bed later. She also introduced a strict lunch time nap (for two hours at least) which probably accounts for the later bedtime. We also had to administer pain meds twice this week. And on Monday night, she puked the entire contents of her bottle onto her dad while he was trying to feed her her solids. (First time she has vomited in her life!) She took that remarkably well, actually. Didn’t even cry. The last two days, we have noticed that her right eye is red, particularly in the corner. The sister said pretty much all the symptoms could be accounted for by the teething. Even the red eye, which incidentally is looking better tonight. As with everything else, she took the teething so well, we didn’t even notice what was going on, though we did suspect. Her appetite has been a little down, but not by much. Her good humour has remained fully intact. So yes, we are still completely spoilt parents! Apart from Mama, Dada, Baba, num-num and lig, she is calling the dogs by their names, Bear and Teddy, and when asked what sound a duck makes, she says quack-quack. Granted, it sometimes sounds more like kak-kak, but I’ll take it. Also, Mmmmmmm for a cow. Firstly, she said bye-bye to her daddy when he left for work after lunch, accompanied by a wave. Three times she said it. She has also been saying num-num when she is eating but only if it something she likes. She’s been doing that for a couple of months. Then there’s been plenty of ‘mama’s’. Not sure if she knows that’s me, lol. I do get a lot of them directed at me. Lately there have been some ‘baba’s and ‘dada’s too. Oh, and she has started making a beautiful, guttural ‘g’ sound, which is directed squarely at any ‘lig’ (light). So not exactly sure which classifies as her first word, but they seem to be coming thick and fast. She loves msuic, and clapping to it. Has quite a nice sense of rythym, too. Also loves her books. Almost as much as TV 😛 The latter is limited, but she loves Baby Genius and Barney. One of those things I vowed my baby wouldn’t do! Today, when daddy got home for lunch, she was in her walking ring. He opened up the back door for the dogs to go out, and madam followed in their wake. (Heavily supervised by us). She navigated the doorstep and the step off the little stoep with utter confidence (thank heavens for a very stable walking ring!) and took off on the paving with squeals of delight. Her and I took turns smelling the potted roses, me making sure she didn’t reach for a thorny branch. I want to relocate the potted roses for the Winter so that she has more space to run in her walker. Bet everyone will be surprised to see a post from me in their blog feed reader. Haha. I’m surprised I haven’t been blogging more, because it has been going really bad with my MS, and that is usually a trigger for me to blog. But the thing is, I have been feeling too bad to blog. It has taken till now for me to be able to type reasonably again. At a stage it was almost impossible, that’s how badly my hand co-ordination was affected. I’ve just been treated for a relpase. I was in hospital for two nights (7th and 8th May), which was kind of awful, being away from my Vivi Rosebud. Luckily, Michael is an extremely hands-on and capable father and they coped just fine without me. The morning I was discharged, Vivi didn’t really want to smile at me, or make eye-contact much. She was confused at my two day disappearance (even though she did see me in hospital a couple of times). She did get over it quickly, once she realised I was back to stay. And that night we had a very special cuddle, with plenty of giggles and her stroking my face and hair so, so gently for ages. She held hippo (her lovey) up for me to kiss, and then dissolved into giggles when I did. Then she held her little hand up for me to kiss, looked deep into my eyes and stroked my cheek. It was an incredibly special welcome home from hospital. The relapse that I had treated was a scary one. The right side of my face suddenly got quite paralyzed. The corner of my mouth drooped, and speech got markedly difficult and slurred. My eye was sort of hanging, as well. And this all within the space of 24 hours. I phoned my neurologist, who said better that I have IV steroids a.s.a.p. I’ve subsequently been to Jhb to see him and he confirmed that it was a relapse, explained the whereabouts of the nerve damage, with the aid of some helpful diagrams and told me that it might take up to three months to recover! Over the next day or two, I experienced disturbing muscle tone issues in my mouth, really battling to eat and swallow. Things that we all take way for granted, like moving food around your mouth with tongue, became challenging. Today, though, I have noticed quite a dramatic improvement. With any lcuk, recovery will be speedy because I treated so soon. (Really, Wednesday I noticed problems with my speech, Thursday, I noticed that my smile was decided lopsided, and by Thursday evening, I was mainlining the first of my solu-medrol drips.) Hopefully this limited the rampage that such a relapse can wreak. So, I’m over the worst. Relapse has been treated, and I am mostly over my cortisone crash. Which is no more fun than I remember it ever being. This morning, Vivienne and I even went to our Mother’s and Miracles class, which we have skipped for a while. Vivi is a truly remarkable child. I am in awe every day. Teeth: two adorable little bottom teeth. Crawling: yes, from the age of nine months. Waving at her mommy: yes! As of a couple of days ago, and it justs melts me. 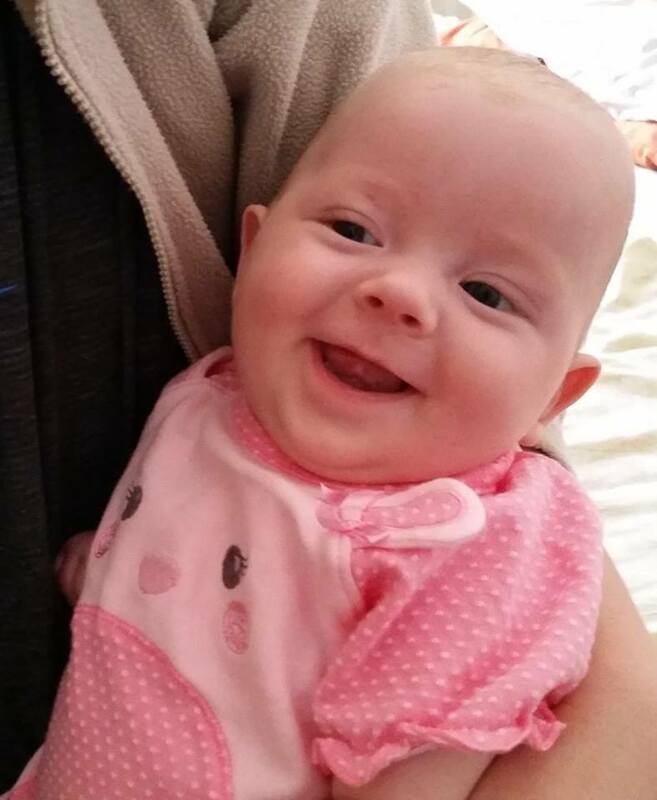 In honour of Vivienne’s three month anniversary, I decided to start up my blog again. I have so much to share, all of it very good at this point. I survived the pregnancy, obviously, although it was pretty rough going. Not something I am going to repeat in a hurry. Or ever. But I am SO glad I did it. So glad it happened; so glad this little angel was sent to us. I have never been happier in my life. Vivienne, who we are calling Vivi, is just the most amazing baby. She has the sweetest personality and she is just so easy. Everything that a good baby should do, she does. She eats well, poos well, sleeps well and is so social and friendly to everyone. And she’s so beautiful. I’ll tackle the backstory, including the birth and our first weeks in the near future. But at least we are back online. Thank you for the all the supportive comments, especially during the last few months of my pregnancy. I appreciated them so much. Finally. My little Vivi Rosebud’s birth day has arrived. I am so ready to not be pregnant anymore. My right foot looks like a sausage and I have a cankle. This was enough of a worry to have a doppler test done to check for thrombosis yesterday. Luckily, I got the all-clear on that. Gynaecologist said anaesethiologist is not happy giving me a spinal block because of the MS. I have been worried about this too. So it will be general anaesthetic. I feel happier about this. I wish you a safe passage to the outside world tomorrow, my little sweetheart. I can’t wait to see your little face and hold you in my arms. I love you so much already. Scary, but the most wonderful day ever! Nationalities that have visited here recently.